Approx. Weight: 6 lbs. 8 oz. Salame Rosa, or pick salami if you like, is a salame cotto, a cooked salame, so different from the salami that we all know, a relatively hard, aged sausage with pieces of fat scattered around the dry red meat. 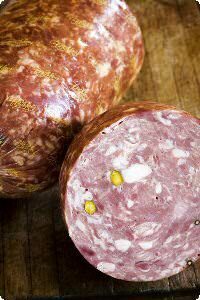 Salame Rose is from the city of Bologna in Italy and this Bolognese sausage is made here in the US by Fra' Mani from prime cuts from the shoulder, coarsely chopped to create a distinctive mosaic face and speckled with small cubes of plate fat cut from high on the hog. The roughly 6.5 lbs. salami is dry roasted and mildly seasoned with coriander, white pepper and mace, and studded with pistachio nuts. Please note that salamis are often not exactly the indicated weight; we'll therefore charge your credit card according to the weight of the Salame Rosa that will be shipped to you. Ingredients:pork, water, contains 2% or less of sea salt, spices, garlic, dextrose, sugar, pistachio, celery powder, starter culture.